It should be no surprise that the Amsterdam culture is largely a product of cosmopolitan influence, given its history as a port city from which the seven seas were sailed. Amsterdam is literally bursting with galleries, museums and theatres. This page is about 'high brow' culture in Amsterdam. If you'd like to know about the cultural of ordinary authentic Amsterdammers, read our page about folk culture in Amsterdam. Find more cultural tips for going out on our Amsterdam nightlife page. 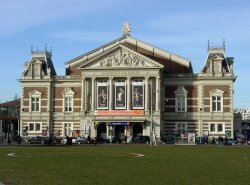 The Concertgebouw (Concertgebouwplein 10), located on the southern end of Museumplein is reputed for its beauty and fine acoustics. This 19th century building that once hosted Brahms and Strauss, today hosts the Koninklijk Concertgebouworkest (Royal Concertgebouw Orchestra), named by Gramophone Magazine as the top symphony orchestra in the world. Explore the new activities in the place of Amsterdam's old stock exchange, Beurs van Berlage (Damrak 243 & Beursplein 1). Today, it is home of Netherlands Philharmonic and the Dutch Chamber Orchestra and is considered an important Dutch architectural monuments. The Muziektheater (Waterlooplein 22), also known as "Stopera" because its dual housing of the Stadhuis (City Hall) and the Netherlands Opera and Netherlands Dance Theater, also stages the performances of international companies. The Carré Theatre (Amstel 115-125) is a lavish gem along the Amstel River, the namesake of the city. Over a hundred years old, the building was once used for the spectacular circus of Oscar Carré. Today, entertain yourself with dance and music theater that is occasionally in English. Another important theater is the Stadsschouwburg (Municipal Theatre), a grand red-brick building located at Leidseplein 26. Be sure to check out the Holland Festival during the month of June to enjoy a an eclectic mix of opera, theater, and dance productions. The Westergasfabriek (along the Haarlemmerweg 8-10), the re-purposed, former Gas Company complex in Westerpark, has the Ketelhuis cinema, theater, gallery, and concert hall. Winter vacationers should check out the Winterparade, a two-week long festival at the end of December showcasing theater, music, and dance. Museums are important in Amsterdam. 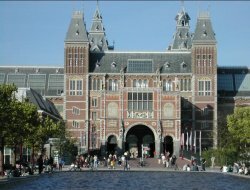 No city has more museums per inhabitant than Amsterdam. The three most visited are the Van Gogh Museum (dedicated to this most important painter of the 19th century, Paulus Potterstraat 7), the Rijksmuseum (housing Rembrandt's light and dark brilliance and other 17th century 'Dutch Masters', Jan Luijkenstraat 1), and the Anne Frank House (the hiding place of this Jewish girl in World War II, Prinsengracht 267). A new addition is the Hermitage Amsterdam (Amstel 51), an independent venue of the Hermitage in Saint Petersburg (Russia) which celebrates and explores the opulence of the Tsarist age in Russia. The Hermitage is along the Amstel River, in the 17th century building that housed aged women for hundreds of years, up until 2007. 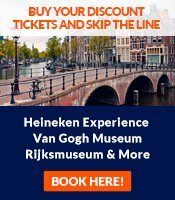 If you want to know more about how Amsterdam developed through the ages, visit the Amsterdam Historical Museum (Nieuwezijds Voorburgwal 357 & Kalverstraat 92). Our Lord in the Attic (Ons' Lieve Heer op Solder, Oudezijds Voorburgwal 40) shows a clandestine catholic church from the 16th century, when Catholicism was suppressed in the Protestant Netherlands. Read more about the leading Amsterdam museums or check our list of the top-25 of museums in Amsterdam. Galerie De Appel (Nieuwe Spiegelstraat 10) - This has a reputation of showing everything that's 'happening now'. It used to focus on live performance art installations but has grown to include multimedia, paintings and sculpture. 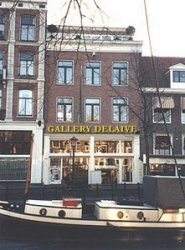 Galerie Delaive (Spiegelgracht 23) - A very international gallery run since 25 years by very original Amsterdammer Nico Delaive. Shows artists such as Appel, Christo, Lichtenstein and Warhol. Herman Brood Gallery (Spuistraat 320) - Located on the second floor of Café Dante, this gallery shows works of the most notorious Dutch rock star. Opinions on the quality vary, but a legend in Amsterdam he was. Galerie Paul Andriesse (Gebouw Detroit, Withoedenveem 8) - One of Amsterdam's most important galleries, running expositions from among others renowned artists Marlene Dumas and Keith Edmier. The Vondelpark has a free concert series through the summer months. Enjoy the jazz, classical, and more on the stage from the open space below or the stadium seating. There's also a concession area for beer and food. 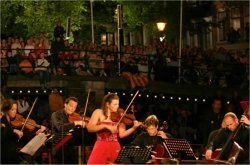 The Grachtenfestival (canal festival) is a free concert series on the water during the third week of August. It culminates in the hugely popular Prinsengrachtconcert, when every boat in Amsterdam is jammed in the Prinsengracht canal. Come early as this unique concert on the water is quintessential Amsterdam culture, attracting more than 50,000 visitors a year. The Conservatorium van Amsterdam (Oosterdokskade 151), the city's music conservatory, is a clever way to experience the genius of rising talent. Final examinations, workshops, evening concerts, projects and more are open to the public free of charge and may be explored on their online calender of events. What is folk culture in Amsterdam like?